Last summer we visited the Museum of Science and Industry in Chicago. 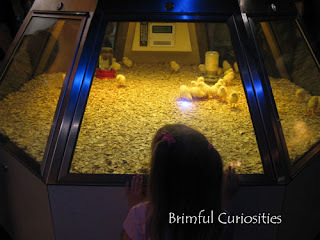 My daughter loved many of the exhibits but one of her very favorites was the Baby Chick Hatchery. She witnessed a baby chick peck out of its shell and she's had a special fondness for chicks ever since that experience. 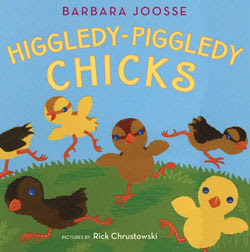 Chick and chicken books appeal to her greatly so you can imagine her excitement when we read Barbara Joosse's latest book, Higgledy-Piggledy Chicks. Bucka-buk! Bucka-buk! Barbara Joosse puts readers right in the middle of the barnyard with a story about a protective Banty Hen and her seven baby chicks. Seven eggs hatch into seven adorable and multicolored chicks. Those little chicks soon leave the nest to explore the vast barnyard and run higgledy-piggledy in every direction. Danger lurks hidden nearby but mama hen and the aunties do their best to keep the curious little chicks safe day and night from the cat, raccoon and snake predators. Higgledy-Piggledy Chicks is a lively read-aloud for all young children, even toddlers. Joosse does a marvelous job capturing the sounds and sights near a hen house. 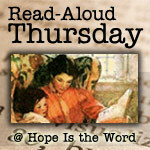 There are plenty of peeps, clucks, kuks and kaaks sprinkled throughout the expressive text. Both my kids listened to the story intently, felt deep concern for the little chicks as they wandered around the barnyard and tried to guess what kind of predators lurked on the pages by using clues from the illustrations. Chrustowski's colorful collage illustrations have a certain depth to them - he used colored pencils to draw shadows and details on the cut figures. Both kids loved the page where the chicks hatch. They counted the chicks and picked out their favorites from the multicolored bunch. My daughter said that one of the little chicks looks like it is sleeping in a little egg shell crib. Chrustowski used actual chick models for his illustrations and at the end of the story provides pictures of the real chicks running around his studio. Joosse provides an educational description of how little chicks grow in the back of the book and tells a little bit about the Bantam hen breed. One last reason why we simply adore the book -- both the author and illustrator live in our wonderful state of Wisconsin! We constructed a chicken coop for our stART (story + art) project this week. My daughter painted it red, just like the one in the book. 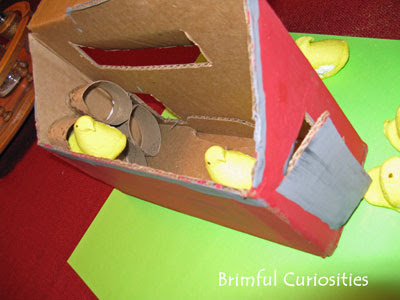 I cut out the doors and we added nesting boxes inside by cutting apart a paper towel tube and gluing the circles inside. Originally the intent was to create a PEEPS diorama, but we ran out of time so my daughter and son just had fun playing with the seven marshmallow treats and red chicken coop. The large, red chicken coop in Higgledy-Piggledy Chicks resembles the one I remember on my grandparents' farm. The coop had a little door for the chicken to enter on one side. I entered the coop through another large wooden door with my grandma and mom and helped gather the eggs from the nest. Those chickens sure could make a loud ruckus, feathers flying everywhere, bawk, bawking! 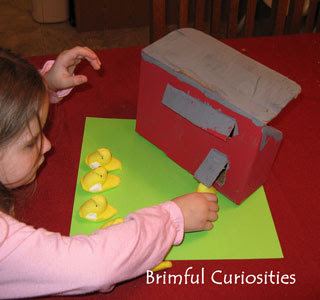 Someday I hope my daughter and son both have the chance to experience gathering eggs in a barnyard coop. I love the nesting boxes! The coop turned out very much like the one in the book - terrific. These are so cute! They really turned out great! What a neat craft idea to go with that book! I've been saving some empty tissue boxes that I just KNOW I can use for a craft sometime, and making a building from a story may be just the thing. Thanks for the idea!! I love the chicken coop! What a great idea. I am going to have to look for this book! How cute is that?!? Love it! We spent some of our vacation last summer at a B&B on a working farm. So much fun, especially when E got to gather eggs for breakfast! That is wonderful, and it looks just like the one in the story!! What a great idea! This is terrific! I love chicken noises in books--so realistic and so much fun! Both the book and the craft turned out great. 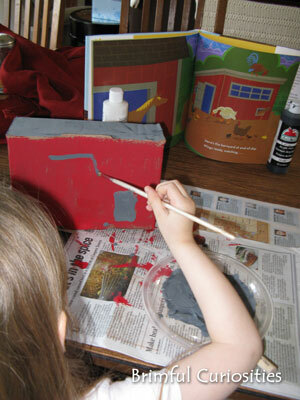 What fun to create your own chicken coop. I bet she loved making that! I would be totally obsessed with chickens too if I'd seen what she's seen. What a perfect palace for pretty Peeps!